Expenses like Laundry, Telephone, Drinks, tips, Portarage etc. Any Accident Insurance. Any thing not mentioned in the inclusions. On Arrival Guwahati Rail Station or Airport , We will Meet and Transfer to Kaziranga , Night Stay at Kaziranga Hotel. In the heart of Assam, covering an area of 430 sq-kms, is inhabited by the world's largest population of one-horned rhinoceroses, as well as many mammals, including tigers, elephants, panthers and bears, and thousands of birds. In 1985, it was declared a World Heritage Site by UNESCO for its unique natural environment. After breakfast, check out from hotel & proceed to Nameri. On the way visit Tezpur town (Mahabhairan Temple, Agnigarh) and after arrival at Nameri Eco Camp. Overnight stay in Nameri. Covering an area of 200sq.kms, it is situated in the District of Sonitpur; the Nameri is the third National Park of Assam. 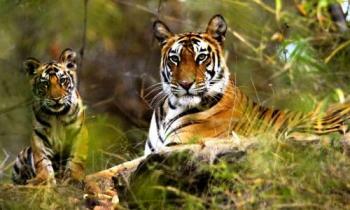 It is a Tiger Reserve and also a birders paradise with more than 376 species of birds recorded so far. The inaccessibility and continuity with the neibouring forest areas have helped the wildlife of Nameri to flourish. There is a good prey base in the form of Sambar, Barking deer, Hog Deer, Wild Boar and Gaur. About 3000 domestic cattle also form part of this prey base for Tiger and Leopards. Today early morning at about 05.30 a.m, we set to explore the park on foot (3.2kms), after the trek back to the camp. After having breakfast go for an exclusive rafting (mild rapids) trip on Jia – Bhoreli River, flowing along the National Park, for water birds. Return back to the camp. Overnight stay at camp. After Break Fast proceed to Manas National Park. Overnight stay in Manas. The National Park was designated as a Tiger Reserve in 1973.Situated in the foothills of Bhutanese Himalaya, it famous for its majestic Tiger and Golden Leaf Monkey discovered only a few decades ago. It is a paradise for bird lovers, birds which can be seen here are the Giant Hornbills, Pheasants, Jungle Fowl, Scarlet Minivet, Partridge, Florican and variety of water birds. Early morning Elephant ride. After breakfast go for a jeep safari in the most beautiful point of Manas National Park Mathanguri. Overnight at Manas. After breakfast, proceed to Guwahati,Visit MAA KAMAKHYA TEMPLE & drop at Guwahati for next destination. Hotel Accommodation for 06 Days with Breakfast. All applicable taxes such Driver Bata, Toll charges, Parking charges, etc.